Cala Blanca, aptly named with not one but two, sun bleached sandy shores. Lying on the west coast of Menorca, this lovely resort is the perfect spot for families with young children and for couples of all ages. Nothing disturbs the peace in this haven of relaxation. Although a purpose-built resort and lacking island authenticity, it more than compensates with its stunning location. Sheltering among verdant coves with exceptionally clear shallow water, and warm to boot, it is hard to beat. If you are seeking a guarantee of summer sun where you can relax and forget the cares of the world, look no further. 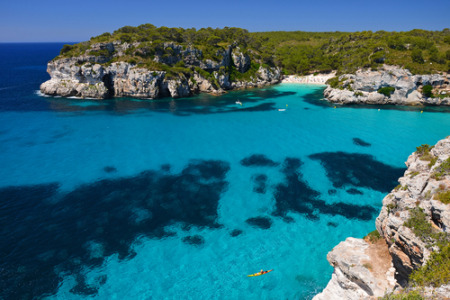 A cheap Cala Blanca holiday will fit the bill. The holiday season lasts from April until October with early and late season popular with walkers and cyclists when temperatures are less intense. Cala Blanca's modern accommodation was built with comfort in mind and the variety of hotels and apartments means that it caters for all budgets. The many restaurants cater for all tastes with everything from fast food outlets to fine dining, and from traditional fish restaurants to those serving international cuisine. Local wines offer very good value. Tourist shops are in their usual numbers but if you like markets, head for Cuitdadella on Friday and Saturday. The markets always begin in the early morning and close at lunch time in order to avoid the heat of the day. If you fancy a Cala Blanca holiday but find the task of trawling through web page after web page looking for the best deal more than a little off-putting, try our simple search facility. You'll find over three dozen travel companies, including leading brands, competing for your custom. It is simple to use, and remember, competition brings out the best bargains. Our search facility enables you to see, at a glance, the Cala Blanca holiday that is the cheapest, and the one that offers the best value for money. It couldn't be easier. All you have to do to secure the holiday is make a phone call. As offers change daily, in order to avoid disappointment, you should ring today.